Catalogs - American Saddlery Combining Quality Craftsmanship & Modern Equine Industry Innovations to create your favorite Saddles. Feel free to view or download our catalogs. 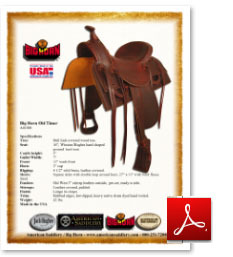 CURRENT 2017 CATALOGS: These catalogs are for consumers looking for a Genuine - American Made saddle from Big Horn and American Saddlery! Please note that we do not sell directly to the public. Please use our dealer finder to locate a dealer near you. If you don't have a local dealer please feel free to contact us and we will help you contact one. We have many that ship around the world! 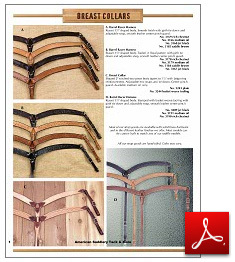 VINTAGE RESEARCH CATALOGS: Are you looking for information about a vintage American Saddlery or Big Horn Saddle? Scroll down! This is your starting point. Browse the growing number of vintage catalogs we've uploaded. The number of catalogs is growing as we have time to add them. PLease note that prices in the vintage catalog are in no way current. American Saddlery, Big Horn, or any of our dealers will honor any prices shown from vintage catalogs. For research and historical use only. If you are a dealer - please sign in to access pricing and additional information. Contains all current Big Horn and American Saddlery Saddles for 2017. Matching tack for Big Horn including Tuffy Brand items. Please note that some items cross-over with American Saddlery brand items. 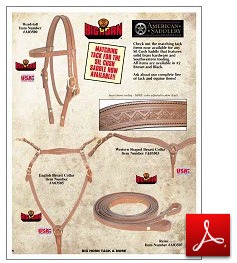 Matching tack for American Saddlery and additional items. Please note that some items cross-over with BIG HORN brand items. 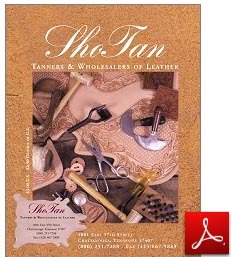 Sho-Tan leather catalog. Please note that if you call in for leather prices that chances are the next time you call the price will be differentr. All leather sides, and other pieces of leather, sides, bellies, latigo, harness, exotic, tools, hardware, etc - are priced on a weekly basis. Changes in leather tannery pricing is an active market. Our basic selection of Silver Conchos. Please note that silver pieces, designs, and conchos have changed over the years. This is due to suppliers changing designs, suppliers going out of business, as well as other factors. We may not have pieces that match items found on older American Saddlery and Big Horn Saddles. 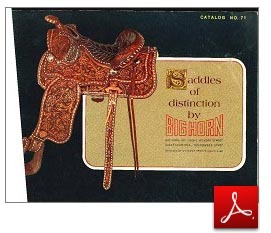 These catalogs are for those searching for information on vintage saddles from Big Horn and American Saddlery. We get so many calls and emails a day from people searching for information that it is impossible to dedicate the time to helping everyone find information on saddles dating back to the 1960's. We love our American Saddlery and Big Horn fans and wish we could dedicate the manpower to a full time research person. This is the best solution we could think of. PLEASE NOTE: Any pricing shown in the Vintage Catalogs is not current and will not be honored by American Saddlery, Big Horn, or any of our dealers. Catalogs are for historical and researching saddle specs only. The catalogs are all outdated. More vintage catalogs will be added soon. Saddle sections are shown only, tack, pads, etc have been excluded.